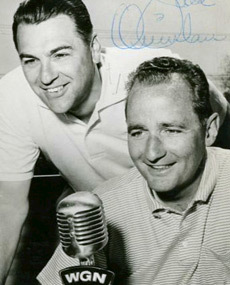 Jack Quinlan (bottom) and Lou Boudreau did their sixth regular-season WGN Radio Cubs broadcast from the odd-looking, for baseball, Los Angeles Coliseum on April 22, 1958. The Chicago Baseball Museum kicks off a series of five podcasts here commemorating the 57-year relationship between WGN Radio and the Cubs that is ending this season. 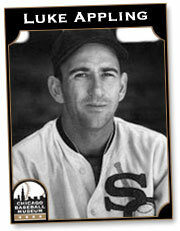 The vintage segment presented today was part of WGN’s sixth regular-season broadcast upon assuming the Cubs’ radio rights in 1958. On April 22 of that season, announcers Jack Quinlan and Lou Boudreau describe the strange layout for baseball that was shoehorned into the 100,000-seat Los Angeles Coliseum. The broadcast was the Cubs’ first visit to Los Angeles after the Dodgers had moved from Brooklyn. The clip begins with Boudreau in 1997 recalling how the golden-voiced Quinlan helped break him into his long Cubs announcing career in 1958. The Boudreau interview and vintage broadcast first aired on the Diamond Gems baseball radio show in 1997.